Take your beer dispensing to the next level with this professional-grade, forward-sealing Perlick faucet. Perlick beer faucets are famous for excellence and innovation, and the Perl 630SS is no exception. This faucet is engineered to excel over the discontinued 525PC version. Made from 304 stainless steel, the Perlick Perl 630SS is a high-end, ultra-durable draft beer faucet. The stainless steel resists corrosion, will not tarnish, and prevents off-tasting metallic flavor from ruining your beer. For additional reliability, this faucet is designed with fewer internal parts while delivering exceptional performance. One of the many highlights of the Perl 630SS is its patented forward-sealing design. Using the revolutionary Perl ball and a forward seal, the design ensures that your beer is not exposed to outside air, which could cause bacteria to grow in the faucet and the lever to stick. Also, the spout is more vertical than a typical faucet to prevent beer from collecting inside the faucet. NSF-approved for commercial use, the Perlick 630SS faucet is designed for professional bars but is also perfect your home bar if you appreciate top-quality draft beer. It can be installed in new draft systems or used as a replacement for an outdated faucet. You can use this faucet to serve a wide range of beers, as well as wine on tap, kombucha on tap, large-batch cocktails, or anything else you're pouring. Installing your new stainless steel beer faucet is easy, as it connects with all standard shanks and beer towers. For the finishing touch, screw on your favorite tap handle (not included). Smooth operation, easy to clean, stays clean. Everything I want in a beer faucet. Excellent product works so much better than the cheap entry level faucet. I was looking for a faucet to replace the one that came with the beer fridge. The original would be very difficult to move if it was unused for a few days. After some research it seemed the the Perl 630SS was recommended. It has been absolutely great with no problems. It's been fine after a week or more of non-use. This faucet is amazing! The one that came with my kegerator was so hard to pull. This Perlick faucet is as smooth as silk! I love it! I replaced my discontinued faucet that was leaking with this one and I couldn't be happier! Works great and has some improvements such as the handle shaft that doesn't rotate now! Just had a party last weekend and it performed flawlessly and had a perfect pour all day! Well worth the money!! This faucet is either open or closed. There's no slide to expose beer to air within the faucet. Great purchase. And pour! Excellent product -- easy to clean, sturdy, good looking. This tap pours great with minimal head. It's a smooth operator ?? Product looks and performs exactly as expected, I would highly recommend this product to anyone considering replacing or upgrading their current kegorator faucet. These are great. My two taps are at a vacation home so they are not used very often. The old faucets used to stick so bad that I broke the handle off of one of them. That's when i found these. They install easily and never stick. They are worth the money. I went with the stainless steel because I thought they would be stronger. I would buy them again if I ever need to replace them. A little expensive compared to others, but worth it to prevent sticky faucet if you don't use your Kegerator all the time. I highly recommend if you are looking to upgrade. 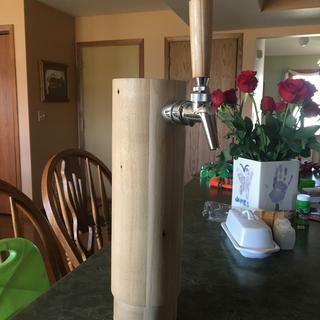 Just what I wanted for my kegerator! The taps that came with my kegerator stuck badly if I didn't use them for a day or two and I had to disassemble them to clean them so I could get beer. These taps worked perfectly after I returned from a week at the beach. They are just what I needed for the darker beer I like to drink. Beautiful on my double tower, consistent pour and shut off, easy to clean. Purchased one to solve a sticking issue with my Kegerator and worked so good I ordered one more for my other tap! Love this faucet, worth the upgrade. I had the older version of theses and had a few issues. After talking to someone at kegworks I decided to give these a try. I love them. The beer pours great, no stick and no dripping. Definitely recommend them. Love my perlick faucets! 630ss are easy to clean and don't drip. Great price and fast order processing and shipping! To replace the stock faucet that came on my kegerator with a better quality one. I’ve been noticing some small dark debris, flakes, occasionally in my pours. I’ve been using the brass faucet that came with my kegerator for 6 or 7 years. I’ve been religious in cleaning my system, but it wasn’t until today that I could see the nasty stuff deep in the brass inner workings. I’m hoping that a completely stainless steel faucet will solve the problem. I have had the 680SS faucet for several years and it has performed well, but the push-back creamer function is not always helpful in my application and sometimes takes novice bartenders by surprise. The simpler 630SS faucet should simplify my user interface. This type of faucet was recommended by my local cicerone as a type of faucet that may help to decrease the amount of foam poured, as well as one that may not get as much "beer glue" in the system for a home tap which doesn't get used as often as at a business establishment. Current tap is sticking even after 1-2 days of non use. Want to try the Perlick as it is reported not to have this issue. I want to eliminate sticky faucet frustration. Perlick taps are cleaner than most taps and don't get stuck. I was researching how to prevent the faucet from sticking and some of the forums mentioned the Perlick Perl as a good fix. I have read about these Perlick Faucets. I wanted a stainless steel faucet and I thought I would try this one. I like the stainless steel and less moving parts. Beer doesn't corrode stainless steel like brass would, and also, this faucet is easier to control flow rate of higher carbonated beer without pouring a glass full of foam. great faucet. Highly recommend upgrading. Leaves no "black gunk" inside faucet. My original faucets stick if not used daily. The reviews said these faucets would alleviate that problem. Recommended to me by my local beer connoisseur. Reliability, longevity and sleek design make this the best choice for us. I had the Perlick 525 faucet and needed replacement parts to fix a leak. I looked up the replacement/rebuild kits and some said they made the faucet seem clunky/cheap so I decided to put the money for the rebuild kit into a new faucet. Now I get a new faucet and I don't have to mess with rebuilding the old one. Win/Win! Upgrading my kegorator to a better tap made of stainless steel. I broke one of my brass faucet levers and thought getting a stainless steel one would be stronger. While shopping I saw the new Perlick faucets and decided to upgrade both of my faucets rather than just replace the lever. which is better brass, chrome or stainless ? BEST ANSWER: HI Mike, I ordered the stainless as I thought the extra expense was not significant. I did not consider brass or chrome. I have had no issues with the stainless and very easy to clean and they look like they will last for years. I recommend them. I have only used the stainless, so can't comment directly on the other materials, but I can't see how anything could be better than stainless steel for this applicaiton. If you want it to last and look great, then pay a little more and get the Stainless! Well worth it!! The chrome works well, however at some point we would like to get the stainless, just because. I'm happy with the stainless. Works great, easy to clean, and sanitary. Stainless definitely. The others will not hold up over time. This faucet is not self closing. However, we do offer a self closing faucet! Check out the link below! It is not self closing -- pull forward to pour, push back to close. An excellent faucet. No complaints. Yes. There's no slide. Either it pours, amazing, that is, or it's closed. Great purchase. Absolutely. This beer faucet is great. You won’t be disappointed. I just installed this faucet on my tower; beer is dispensing very fast with turbulence. Tap all the way open when dispensing; does this faucet require less gas pressure to dispense? I run about 6 psi from the co2 tank. I have about 16’, yep 16 feet of 3/8” tubing to get the pressure down to about 1psi, nice flow. The longer the tubing the lower the pressure to your tap. There are calculation sheets online if you google “beer line calculator” . Good luck. what do i need to build Perlick faucet ? BEST ANSWER: By build do you mean install? I have 3 installed on my kegerator and they are great.